COLUMBIA, S.C. (AP) — South Carolina freshmen A.J. Lawson and Keyshawn Bryant live together as roommates. And they are getting to know what the other one is getting ready to do on the court. 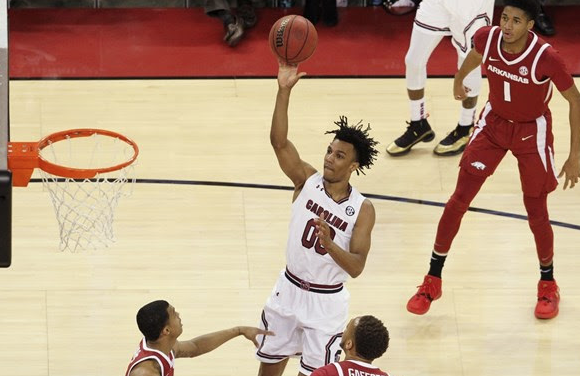 The Gamecocks remain the SEC’s biggest surprise in fourth place after going 5-8 in nonconference play. Lawson and Bryant scored 31 of South Carolina’s 46 second-half points. Lawson started things with back-to-back 3-pointers after Arkansas went up 50-37 with 15:30 to go. ”When he started doing something, I started doing something,” Bryant said. Arkansas (14-9, 5-5) had one last run, taking a 61-59 lead with six minutes left. But Lawson, Bryant and senior Chris Silvahelped South Carolina end the game on an 18-4 run. The Gamecocks made 16 of their last 22 shots. With Jones’ early 3-pointer, Arkansas has hit a 3-pointer in each of its last 1,000 games, the fifth-longest streak in the country. UNLV is tops at 1,067 games. > Carolina’s freshman duo of A.J. Lawson and Keyshawn Bryant couldn’t miss in the second half, combining for 31 points on 12-of-18 shooting (66.7 percent). > The Gamecocks, who shot 54.2 percent for the game (26-for-48), were 17-of-28 (60.7 percent) in the final 20 minutes. > Carolina had just six turnovers in the second half after coughing the ball up 15 times in the first half. The Razorbacks had 16 points off those turnovers in half one, and just two points off turnovers the last 20 minutes. > Lawson finished with 24, one-point shy of matching his career-high. His eight field goals matched a career high for the fourth time and his four 3s marked a new career high. Lawson also had seven rebounds and three assists. > Bryant exploded in the second half, scoring 15 of his 17 points thanks to 7-of-9 shooting. > Senior big man Chris Silva, who had some big buckets down the stretch, finished with 16 points and eight rebounds in 30 minutes of action. He was clutch at the free throw line per usual, going 8-for-10. > The Gamecock defense held Arkansas to below 40 percent shooting for the first time in the Razorbacks last eight games. > Carolina held Arkansas scoreless the final 3:11, finishing the game on a 10-0 run. It marked the third impressive finish on the defensive end in league play for the Gamecocks (held Florida scoreless final 7:17 and Auburn the final 4:01). > The Gamecocks were 10-for-15 (66.7 percent) from behind the arc, the third best 3-point percentage in the Frank Martinera. Carolina was 11-for-16 (68.8 percent) in a road win at Georgia last Saturday, the second-best percentage from deep under Martin. Carolina is back on the road next Wednesday, set for its second meeting with top-ranked Tennessee in a 15-day span. Roy Philpott (play-by-play) and Mark Wise (analyst) will have the call for the SEC Network in Knoxville with tip set for 6:30 p.m. ET.